Added to the list of �things to do before you die,� should be �hearing Monteverdi�s 1610 Vespers in as good a performance as you can find�. 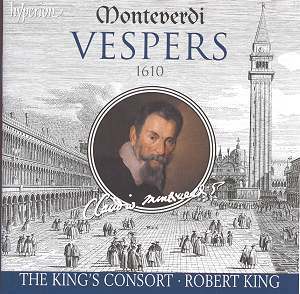 I�ve never heard it live, but until now the closest I�ve felt to hearing the �real thing� has been John Eliot Gardiner�s 1989 recording at the Basilica di San Marco in Venice, the church for which Monteverdi used the 1610 Vespers as his audition material. The vast acoustic of St. Mark�s is certainly an impressive factor in the Gardiner recording, but with St. Jude-on-the-Hill we are not far off a four second reverb, which has pretty much the same effect but without Venice�s sense of airship-hangar infinity. There are many differences between these two versions, and with the Early Music movement in a constant state of flux and development I don�t propose analysing the benefits or otherwise of the various editions and performance ideals which different versions present. Robert King created his own transcription of the Vespers while a student in 1979, and maintains that most of the decisions he made then still seemed �pretty sound� when he came to revise his work for the 2004 BBC Proms. With twenty-five years of performing experience in between, King seems to know what he is talking about. In refusing to provide �added tinsel� to the work and presenting it in as original a form as possible we can value this recording as being at the forefront of modern thought on the piece. Whatever the arguments, this new recording has been a revelation to me. The now quite elderly Gardiner performance is wonderful in many ways, but I quite soon realised that A-B comparisons would be as good as irrelevant. There are of course the differences in soloists and chorus to be considered, with prominent vibrato becoming an issue with the earlier version. What turns me off most now is however the very distance, �atmosphere� if you like, which attracted it to me in the first place. There are many beautiful moments with Gardiner, but with such a huge stage the overall impression is recessed and generalised. With King every aspect of the performance is available to the alert ear, and while you might at first suspect an overly-analytical recording of risking some lack in spiritual content, the Hyperion/King combination have all of this plus the sheer impact of chorus and orchestra in closer, refined detail. The difference, for instance, in having the bass of the organ pushing through and supporting the weight of the whole ensemble is something more than just an added bonus. Hearing the dissonances laid bare in, say, the Dixit Dominus, has the effect of polishing away any woolliness, and Monteverdi�s composition comes up sounding strikingly new and remarkably adventurous, even today. King�s forces provide a sumptuous sound where required, his 24-strong choir and 19-piece orchestra being large enough to give all of the dynamic contrasts one could hope for. Each of the soloists sing with palpable commitment and sym/empathy with the text. I love James Gilchrist�s coquettish little glissando on one of the repetitions of Nigra sum, sed formosa, Carolyn Sampson and Rebecca Outram�s soprano duets are a sheer delight, and Charles Daniel�s voice has an attractive, ringing purity, which is the icing on a rich vocal cake filled with nuggets of subtle inflection and superbly articulated ornamentations. All that is left is the question; to transpose, or not to transpose. Lauda Ierusalem is transposed down a fourth in King�s version, which admittedly has a dampening effect on the festive nature of this piece. The jury is still out on this one as far as I�m concerned. King�s choral dialogue is more urgent and secretive, Gardiner�s in the original key is animated and joyous. The result is a grander, more stately Gloria and Amen close with King - one of those passages of music which inhabits one�s dreams unbidden - but I�m still in awe of the staggering, dramatic contrast Gardiner gets at these moments. The Hyperion version has a further advantage in having the Vespers complete on one disc, and the remaining Magnificat and Missa works on the second. The two Magnificat versions get a truly magnificent reading as one might expect, but prospective purchasers will be intrigued by the less well known Missa In illo tempore. The mass is a progression from themes which appear in a motet by Nicolas Gombert. Monteverdi uses this material in a series of sophisticated contrapuntal movements intended to demonstrate his mastery of these techniques. This �a cappella� based mass harks back to earlier styles and possesses none of the really revolutionary advances of the Vespers. Nonetheless there are enough Monteverdi fingerprints to give us a sense of his personality. The addition of this work gives this Hyperion release a satisfying feel of completeness. Hyperion is to be complimented on the speed with which this release has hit the streets. Under four months from recording to availability has to be something of an achievement, especially for a project of this magnitude. This Monteverdi is truly mind-blowing. Vespers virgins need seek no further, and serious collectors are advised not to ignore what may prove to be more than one reviewer�s �disc of the year�. All my other versions of these works have now sadly been relegated to �inaccessible cupboard behind the sofa� and this one now stands among the select �immediately to hand� collection: I can�t imagine it being replaced any time soon.